For history fans, a trip to Istanbul takes some beating. Here visitors can discover two great cities for the price of one, with both Byzantine Constantinople and Ottoman Istanbul waiting to be explored. To walk the streets of Turkey’s commercial capital today is to take a stroll through the ancient, medieval and modern history; over past two millennia it truly has been one of the most important places in the world. And Istanbul is hardly short of tourists who want to visit the main, blockbuster historic sites like the Haggia Sophia, the Blue Mosque and Topkapi Palace. Big cruise ships dock along the Bosphorus daily and visitors are herded like cattle onto buses for whirlwind, exhausting day trips which include lunch in Turkish restaurants which are about as authentic as McDonalds and end in shady carpet shops where tour guides receive commission on sales. Tourists get to put big ticks on attractions in their guide books, while traders and the government gain important revenue. It’s a win, win scenario all round, surely? Perhaps not. Tourists are only seeing minute fractions of the Byzantine and Ottoman cities – and while the key sites are being preserved, elsewhere historic building and monuments are facing a real risk. Corruption has become ingrained in modern Turkish society, meaning that if developers want to build new hotels in a way which seriously damages ancient and medieval sites they can through the payment of bribes to officials. And it’s not just a question of the odd pot or altar being destroyed; the recent discoveries are far more spectacular. For example, when they started constructing an extension to an underground line a Byzantine palace was found. Once these masterpieces are ruined in the name of so called progress, history is lost forever – it cannot be replaced. Of course, the well-known historic buildings and monuments are important. Take the awe-inspiring Haggia Sophia. Commissioned by the Byzantine Emperor Justinian in 537, it stands as one of the world’s greatest architectural achievements and was built by 100,000 men at a time when Europe was facing a truly dark age. It came at a time in history when the old Roman city of London had been abandoned and many inhabitants of what we now call Britain had returned to live on the land. The Haggia Sophia church was converted into a mosque following the Ottoman conquest of Constantinople in 1453, but is now designated a museum and has many amazing mosaics and frescos on show alongside Islamic calligraphy and decorative artwork. Buildings from the Ottoman era are, in their own way, equally spectacular. The Blue Mosque with its six minarets (the sultan Ahmet I had to pay for a seventh to be added to the mosque in Mecca because some said he was trying to out-do the place of worship at the birthplace of Islam) is named after the blue tiles from the Turkish town of Iznik that adorn this construction, which dates from 1609. The Topkapi Palace, with its complex of interconnected courtyards, pavilions and ornamental gardens dates from shortly after Mehmet II constructed the city and confidently sums up that the Ottomans were in Istanbul to stay. While the likes of England under the Tudors were at the edge of the world, here was a great power that was entering its heyday, with territory stretching as far a north Africa, Arabia and eastern Europe. 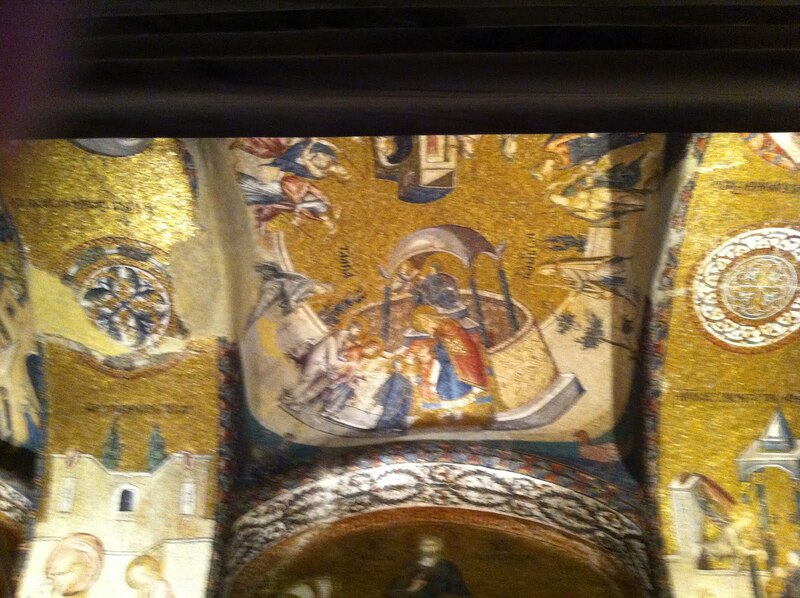 But in terms of Byzantine heritage, the Haggia Sophia is a mere morsel of what can be discovered in Istanbul. On my recent trip to the city I went on an excellent walking tour (run by Istanbul Walks) that took in no fewer than 10 Byzantine monasteries. Of course, they aren’t in perfect condition today as modifications were made when they were converted into mosques and some of the buildings are now in a bad state of repair, but there is more than enough remaining of the original artwork on show to give you an impression of what they must have looked like more than one thousand years ago. The highlight of the tour was undoubtedly the Church of St Saviour in Chora, with colourful glass mosaics depicting the genealogy of Jesus Christ, his birth and ministry, including some of miracles he performed. It is ironic to say the least that today’s secular Turkey has less regard for Christian churches than the Ottomans, whose rulers were of course Muslim, had. Following the 1453 conquest sultans made considerable effort to persuade Christians (particularly Armenians) to live in Constantinople. It must have been a very exciting and multi-cultural place to be. As I’ve noted above, Christians mosaics were plastered over (Islamic forbids image of people in mosques), but at least they preserved the buildings and valued the heritage (plastering over the Byzantine artwork may have even conserved it so that much is still on show for today’s visitors). When the Turkish Republic was declared in 1923 there was a high regard for preserving Byzantine and Ottoman history, and putting it on show for visitors. The first president of modern Turkey, Ataturk, opened both Haggia Sophia and Topkapi Palace as museums. He loved the arts and enjoyed the power that came with opening new attractions to the public. Unfortunately there is not the same commitment to heritage with the government today. History is disappearing in the face of corruption. And, in a country which is celebrated by the US and others for its democracy and the positive example it sets as to how Middle Eastern countries can reform, there is no freedom of the press. The government began a few years ago a crackdown on journalists that are pro-opposition and 100 journalists are currently in jail on ridiculous, trumped up charges. I’ve even heard of the intelligentsia who are prominent is trying to preserve heritage being attacked by gangs working for developers. For a modern nation that in recent years has expressed interest in joining the EU, this cannot be allowed to continue. Turkey’s important history needs to be preserved – it belongs not just to the Turkish people, but to the world as a whole.